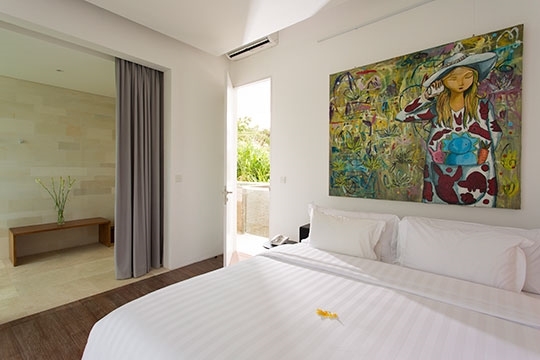 Moments away from splendid Nelayan Beach, in Canggu, the contemporary-styled, four-bedroom Villa Canggu South presents a 20m swimming pool, a compelling collection of art, and a full team of staff. This luxurious property is out-of-town but there are several excellent restaurants, bars and cafés within easy walking distance. A sleek and stylish villa with a beautiful traditional setting in rural Canggu, surrounded by glistening rice paddies and lush coconut groves. With five bedrooms, 21m swimming pool and separate guesthouse, the fully staffed Iman Villa is ideal for families or friends looking for a peaceful, highly contemporary holiday getaway. Big, bold and beautiful, Bendega Nui presides over the rice terraces of rural Canggu, only minutes from a breathtaking surf beach. 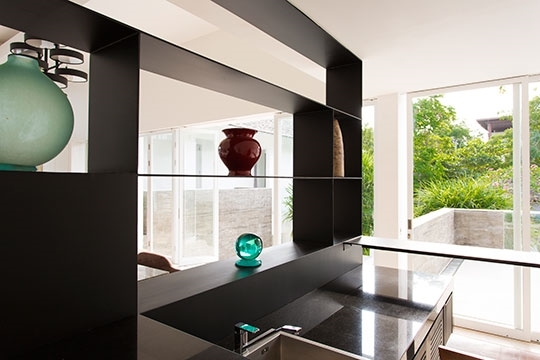 Stunning design, uncompromising quality, outstanding cuisine, excellent facilities and endless space to relax and unwind make this delightful villa a top choice for family or group holidays in Bali. A regal 6+2 bedroom villa, with a 35-metre swimming pool and an awesome garden, The Chalina Estate is big and beautiful, glamorous yet unpretentious. Resting in rural heaven and blessed with breathtaking rice-terrace, mountain and sunset views, the property is perfect for weddings, retreats and large family group holidays. Relaxation at a beachside location is what Villa Canggu South is all about. With the beach just 200 metres away, the ocean breezes that whisper across the villa’s terraces and gently permeate the living spaces will cool you on even the hottest of days. Making a grand entrance to the villa, a wide flight of stone steps leads to a large living and dining room on the upper floor. At one end, sliding doors open wide to fill the room with cool sea breezes accompanied by the melodious sound of the waves. The villa’s stunning 20-metre swimming pool is set in a private walled garden dotted with sweet-scented frangipani trees and towering coconut palms. The sea views are a treat, and ‘Pantai Nelayan’, which means ‘Fisherman’s Beach’ presents a rare insight into the working lives of Bali’s fishing community. The fisherman actually trade some of their catch on Nelayan Beach, which means you can expect some super fresh seafood barbecues expertly prepared for you by the villa staff. Located on the fringes of the traditional village of Nelayan, the villa is ideal for those who wish to escape from city life in peaceful tropical surroundings. You can walk along the beach for miles and watch the surfers riding the waves. 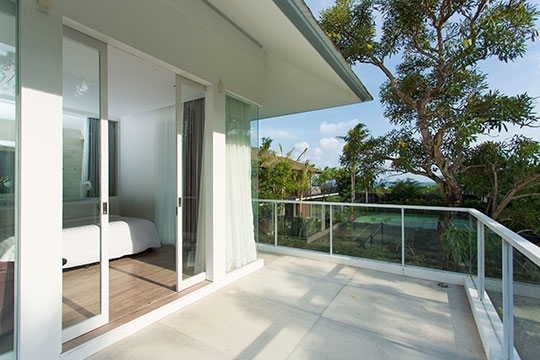 If you’re feeling lazy, Villa Canggu South offers plenty of places in which to relax, so you will always find a private spot for peace and quiet, including a unique chill-out balcony located at roof level with views of the sea, coastline and Bali’s glorious sunsets. The property is well suited for groups of friends or families. It offers plentiful facilities and a professional team of staff including a delightful manager, butlers, a security team and your own private chef, who will prepare delicious meals of Western, Asian, and vegetarian cuisine including children’s dishes (on guests account). Requests will be willingly accommodated, including special diets, seafood feasts and barbecues. 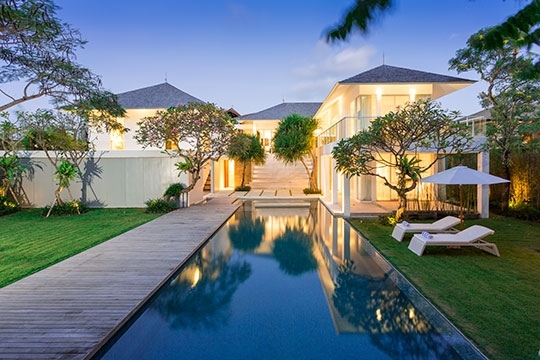 Villa Canggu South is adjoined by the two-bedroom Villa Canggu North (self-contained with its own private entrance), offering guests a six-bedroom renting option if extra space is required. A wonderfully peaceful retreat only 150m from the beach. 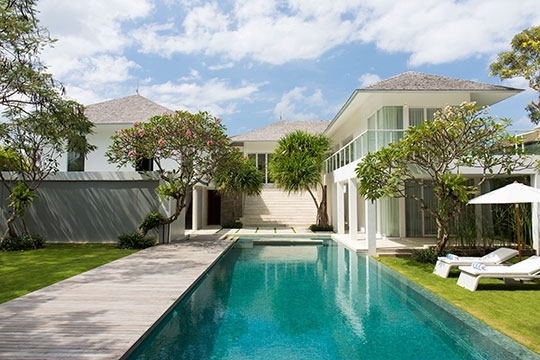 Villa Canggu South is great for families or groups of friends who want to escape from the hustle and bustle of Seminyak. The pool is lovely and the pretty garden features mature trees and an immaculate 15 x 6 metre lawn, which is great for parties and even a family game of cricket. It’s also a big bonus that it’s such short walk from the beach, albeit not a great swimming beach – this is a coast surfing Mecca – so do take care. It is also fascinating to see the local community at work. 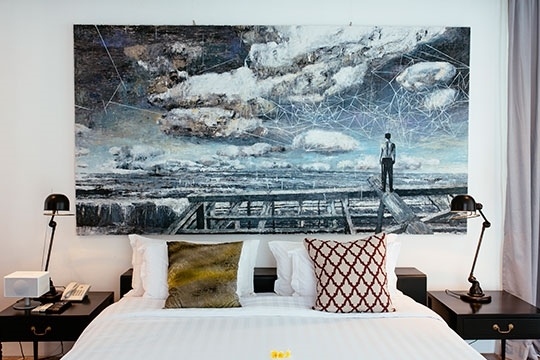 The villa interiors are filled with mesmerising modern artwork – paintings, murals and installations – by renowned local artists; whether you are an art connoisseur or a layman, there are enough art pieces here to keep you fascinated for hours. And there are plenty of spaces to relax. We really enjoyed spending time in the bright and breezy upper-floor lounge. Oh, and we were particularly impressed by the staff. We loved the little chill-out veranda on the roof level accessed by a spiral staircase. In fact, this villa is a wonderfully peaceful retreat all round. Our only disappointment was that there is no sea view from the bedrooms and the living room, but happily the small balcony off the ‘reading room’ mezzanine provides a good spot for watching the waves and the beautiful sunsets over the ocean. Thank you to the lovely team at Villa Canggu, such lovely people and they made our stay so easy and comfortable for our extended family. What a fabulous place to stay and brilliant experience. Thanks to your team for the great service provided during our stay, will be recommending to others. Thank you for making our stay in Canggu enjoyable and memorable. We really appreciate the staffs attitude, always looking forward to satisfy our needs. Thank you so much for an absolutely fabulous time at Villa Canggu. The Mounter Family really enjoyed everything here - especially the pool, the rain showers, the amazing feasts and organizing day trips to Ubud and Uluwatu for us even if we didn't see the Monkeys. Thank you to all the staff at Villa Canggu for such an amazing and comfortable stay. All 5 of us loved the facilities, pool and most of all the great food cooked by the chef. We can't wait to come back hopefully in the near future. Thanks again. 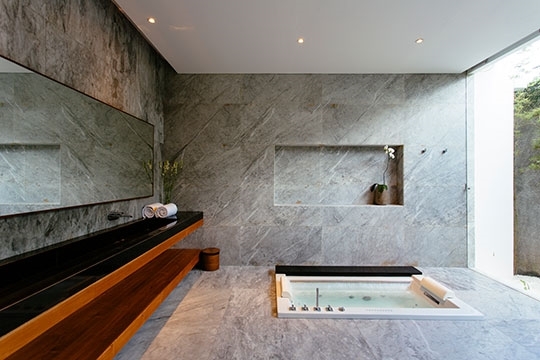 Fantastic modern Bali villa - beautiful rooms, luxurious bathrooms, generous spaces indoor and out. 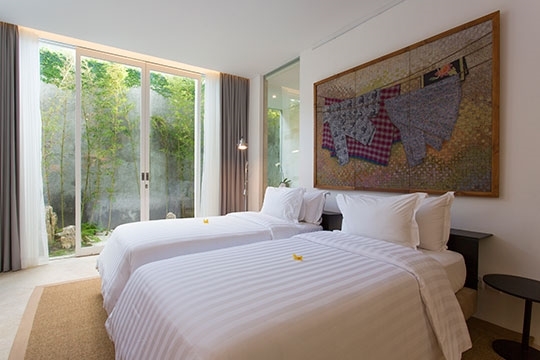 We enjoyed the location, walking distance to restaurants and a short drive from Seminyak. 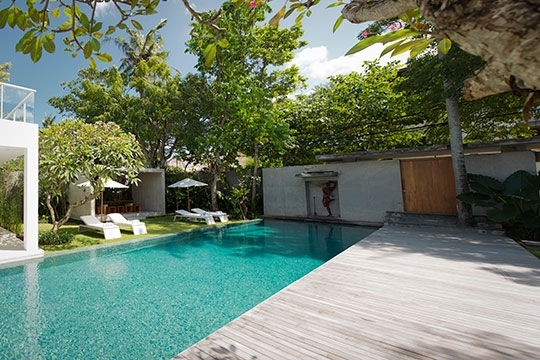 We would highly recommend Villa Canggu. 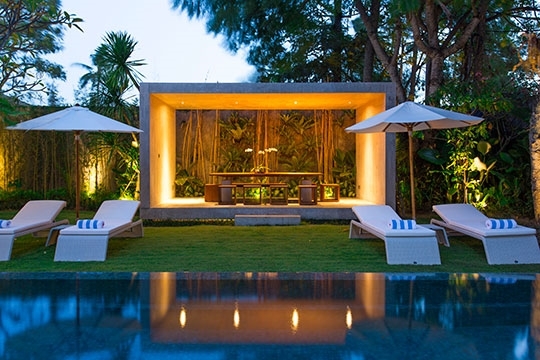 Villa Canggu rests in the village of Nelayan in the sleepy, yet increasingly popular, district of Canggu about three kilometres from the main Canggu Road. The rolling surf of Echo Beach (Batu Mejan) is just a five-minute drive or a 20-minute walk along the seashore, and this is where you will find a a good choice of local restaurants including Skallywags, which serves a daily barbecue. The trendy shops, restaurants and nightlife of Petitenget and Seminyak can be found within 10km. Canggu has become the collective name for a number of villages (including Berawa, Tegal Gundul, Tiyingtukul, Pererenan, Nelayan and Babakan), which, until very recently, could still be described as a sleepy coastal locale. It's now one of Bali's coolest districts. Here, amongst the rice fields which extend all the way down to the beach, you will not only find some of the most luxurious private residences on the island, but also a great selection of eclectic restaurants, cafes, bakeries, boutiques and beach bars – especially along Jalan Batu Bolong, which runs right down to the beach. Popular spots include Finns Beach Club, Old Mans, La Laguna, The Lawn and Ji @ Bale Sutra. Canggu is also an area that most surfers will know about, with reef swells that are larger than those you will find further south in Kuta and Seminyak. Swimming isn’t advisable however as the rips can be dangerous, but there are plenty of other things to do from horseback riding to cooking classes. Finns Recreation Club (for which many holiday villas in the area include guest membership) offers social and leisure amenities, including Splash waterpark, Bounce trampoline centre, Strike bowling, a state-of-the art gym, a 25m swimming pool and a tennis and squash centre. Along the coast to the north of Canggu is Pura Tanah Lot; a sea temple perched high on a craggy wave-lashed rock and probably the most photographed sight in Bali. Sophisticated Seminyak, a few kilometres south of Canggu, lays claim to the highest concentration of independent fine-dining restaurants on the island, including Sarong, La Lucciola and Ku Dé Ta, together with a wide choice of chic cocktail bars, exciting nightclubs, lavish spas and elegant boutiques. The two-storey villa comprises four air-conditioned bedrooms as well as a large air-conditioned, open-plan living and dining room with a bar, a mezzanine ‘reading room,’ a 20-metre swimming pool, a flat lawn and an alfresco dining pavilion. 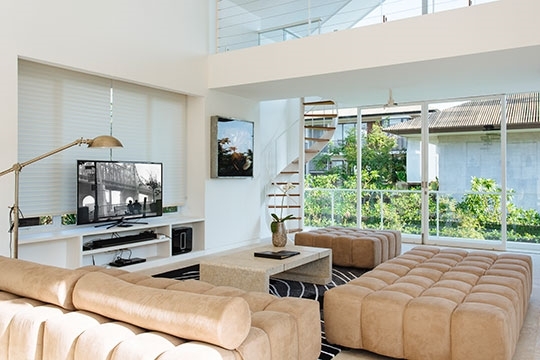 The living and dining room features a sitting area on the seaward side, furnished with a segmented sofa and equipped with a 60-inch satellite TV, DVD player and quality sound system as well as a movie projector. From here, a spiral staircase leads to a mezzanine ‘reading room’ situated at roof level, complete with glass doors that open to a veranda offering views of the ocean. At the opposite end of the room is a bar and dining area furnished with a polished granite dining table for eight. A staircase provides access to the professional service kitchen. Each of the four bedrooms is air-conditioned and equipped with a flatscreen satellite channel TV, DVD player, and safe deposit box. The master suite, located at ground level, is furnished with a king-size bed, sofa, and a desk, while sliding glass doors open to a terrace bordered by bulrushes. Decorated with a handpainted cherry-tree mural, the ground-floor guest suite is furnished with twin beds that convert to a king, a comfy sofa and a hand-painted cherry tree mural. 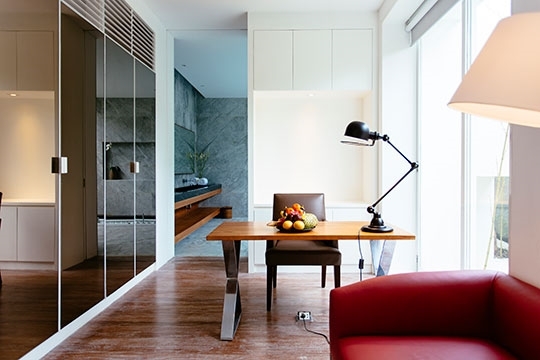 The two upstairs bedrooms are furnished with king-size beds, desks and ottomans. Both of these bedrooms have adjoining balconies, one of which is particularly spacious, overlooking the pool and garden. 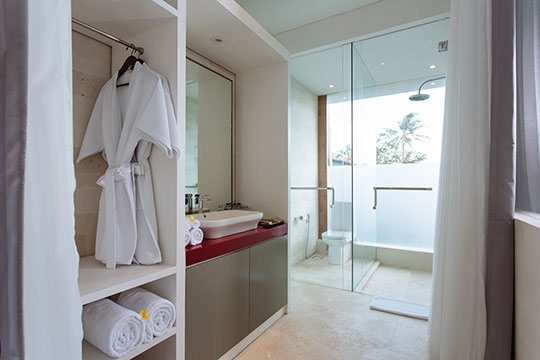 Each guest suite is adjoined by a Palimanan stone bathroom equipped with a walk-in rain shower, while the master bathroom has the added luxury of a soaking tub. In the villa’s privately walled garden is a large a flat lawn and a 20-metre lap pool with a waterfall at one end. A sun deck, furnished with loungers and umbrellas, runs the length of the pool and on the opposite side is the alfresco dining pavilion. Villa Canggu South adjoins two-bedroom Villa Canggu North, and the two villlas can be separated by a retractable garden wall. When all six bedrooms are rented together, the garden can be opened up to create a luxurious space with two pools, two living and dining rooms and interconnecting doors. - Last minute bookings enjoy 10% discount when checking in before 11-May-2019. Lower rate is available when booking the villa without the master bedroom. Contact Customer Service for details. Prices may change based on the time of your booking, arrival date and length of stay. For exact rates please click on the Check Availability button and enter your dates. Whilst every effort is made to keep rates current. They are subject to change from time to time. If there is a rate change you will be informed before a booking is confirmed. 4 bedroom villa located in Canggu, Bali. Ideal for Beach in ten, Body and soul, Kid friendly, Going for golf, Room with a view. 8 out of 10 based on 8 user reviews.